The photographic rewards after a thrilling cutthroat trout fight. Notice the distinctive “red slash” on the underside of the lower jaw. All photos by Craig Schwanke. As my 6-year-old daughter retrieved her lure, a group of six trout appeared behind it with one fish grabbing the lure as she pulled it out of the water. This was a common occurrence as we paddled the canoe around the small weed lined lake. Many readers would assume we were fishing one of the lakes stocked with rainbow trout in Southcentral or Interior Alaska. However, this was a road system lake on Prince of Wales Island and the fish were wild cutthroat trout. The cutthroat trout subspecies found in Southeast Alaska waters north to Prince William Sound are coastal cutthroat trout Oncorhynchus clarki clarki. Cutthroat trout are present throughout Southeast Alaska, especially in drainages with a lake system. Coastal cutthroat trout can be anadromous, which means they spend some time in salt water, but many populations that have drainages connected to saltwater are a mix of sea run and resident fish. 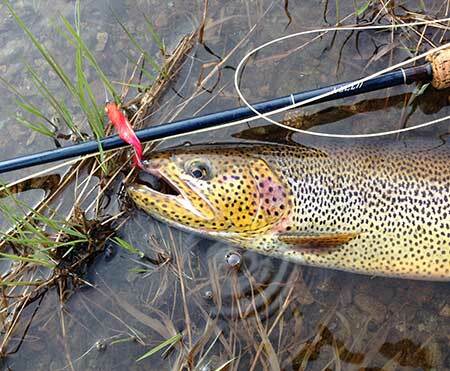 Cutthroat trout size can vary greatly by location. In creeks and lakes isolated from salt water a population may be small fish. In contrast systems connected to salt water generally have bigger fish. Fish over 20 inches are uncommon but are more likely to be found in large systems with salmon, or in lakes that contain kokanee. Regulations for trout (combination of cutthroat and rainbow trout) in Southeast Alaska are conservative with low bag limits, bait restrictions and size limits which are based on Alaska Department of Fish and Game cutthroat trout research and public input. The general regulation for trout in Southeast Alaska is a bag limit of two, an 11-inch minimum and 22-inch maximum size limit and bait allowed September 15 to November 15. Special regulations vary by drainage, or lake, based on angling pressure, trout size composition and public input. Size limits were set based on past department research of cutthroat trout populations in Southeast Alaska lakes that estimated abundance, size composition and length at maturity. Regulations vary by lake with six different levels of regulations. For example, there are thirteen lakes in Southeast Alaska that are categorized as “trophy cutthroat trout lakes” that have a minimum size limit of 25 inches. In contrast, there are also lakes categorized by the department as “small cutthroat lakes” where a 9-inch minimum size limit is appropriate. The size limits vary by lake and are meant to protect most cutthroat trout from harvest until they can spawn at least once. Large cutthroat trout can be found in many lakes of Southeast Alaska. The department recently resumed conducting cutthroat trout research to assess the current abundance and size composition of cutthroat trout in lakes of Southeast Alaska. In 2018 the department conducted a mark-recapture study on Neck Lake on Prince of Wales Island. Fish were captured with baited traps and angling. Over 1,000 fish were caught in each of two sampling events. The data collected will be compared to data collected from a similar study in the 1990s to assess changes in size composition and abundance. In addition, the data will help develop a rapid assessment technique for evaluating cutthroat trout populations in lakes of Southeast Alaska. It is hoped that rapid assessment, which will entail intensive sampling conducted over a three-day period, will provide cost effective data to assess cutthroat trout populations and to evaluate fishing regulations for lakes throughout Southeast Alaska. 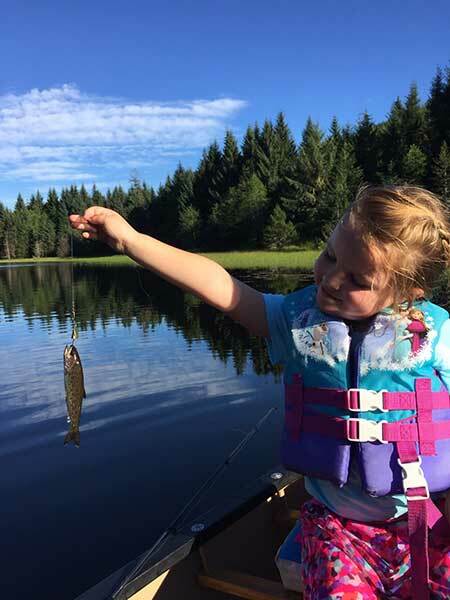 No matter the size, catching a cutthroat trout makes for a lifetime of memories, for both daughter and dad. Cutthroat trout provide an often-overlooked opportunity for anglers visiting Southeast Alaska. Most anglers fish the regions saltwater or freshwater for the large bottom fish such as halibut, or salmon and steelhead. What cutthroat trout lack in size they make up for in abundance, willingness to bite, beauty and uncrowded scenic locations. They are a great species to target for young or inexperienced anglers. 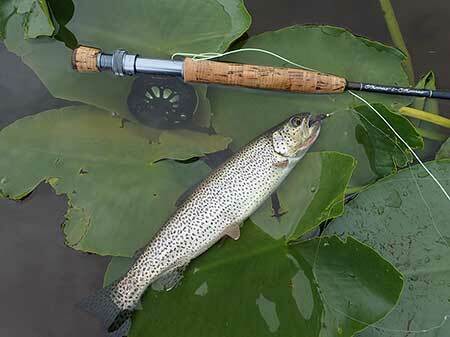 They can be caught on a variety of spinning tackle and are very conducive to fly fishing. The scenario with my daughter is not isolated to one lake. Many lakes in Southeast Alaska provide excellent angling for cutthroat trout and a rewarding option for both resident and visiting anglers. Craig Schwanke is the Division of Sport Fish Area Management Biologist for Prince of Wales Island. He is based in Craig and enjoys the recreational marine and freshwater fisheries the island has to offer. His first hand experience with the fisheries is a benefit to anglers that contact ADF&G to plan a trip to POW.